Intercooler performance is crucial when generating high air temperatures from turbochargers especially following engine management upgrades/ Serck Motorsport is unique in developing specific core choices and fin density options to optimise the cooling effect for both fast road and off road applications. End tanks are also specifically designed, laser cut and carefully welded using flared tubes for maximum efficiency of air flow across the full width of the core. Available for 300tdi, Td4 Defenders and TD5 Defender and Discovery 2, the Terrafirma intercoolers are an easy fit replacement intercooler manufactured to the highest standards to Serck's original design, to enhance air flow and temperature dissipation. 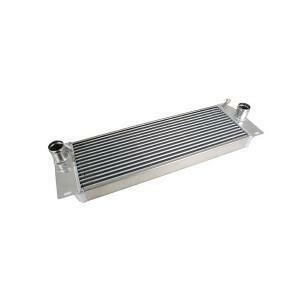 Fast road intercoolers utilise highly efficient 16fin per inch cores and the off road core uses a coarse 9 fins per inch for easy cleaning and efficient low speed performance. This listing is for a Land Rover Discovery Td5 Automatic Model.